The theory concerning atoms. Two opinions of the nature of matter were professed in the Greek philosophical schools. The Eleatic school asserted that matter is infinitely divisible. Democritus, Leucippus, and Epicurus maintained, on the contrary, that in the repeated division and subdivision of anything a point is reached when, by no conceivable means, can it be divided in two; the molecule being a real unity, not compounded of separable parts; in other words, it is an atom. On this idea of indivisibility of matter, Democritus founded his cosmological system. In his opinion, nothing exists but atoms of different shapes and forms, and a vacuum in which the atoms move. The atom possesses, besides the property of solidity, that of movement. The vacuum is nothing by itself; it is only the absence of any impediment to the movement of the atoms. Genesis and destruction proceed from the aggregation and disaggregation of atoms that existed from all eternity (compare Lucretius, "De Rerum Natura," i. 601 et seq.). This theory—which in ascribing the existence of the whole universe to a fortuitous combination of atoms was intended to exclude all intelligent principle from the world-formation—was later adopted, with many amendments, by the Motekallamin as the basis of their dogma of creation ex nihilo. The universe, they asserted, is composed of atoms ( or ), which, on account of their smallness, are indivisible. An atom has no magnitude; but when several atoms combine the sum has a magnitude, and thus forms a body. Atoms were created, and are not—as was supposed by the Greek atomists—always numerically the same in the order of things; but are created anew whenever it so pleases the Creator; their annihilation being impossible. According to Maimonides, the Motekallamin extended the theory of atoms even to space and time. Having seen that Aristotle had proved that space, time, and motion could be divided into parts standing in such relations to one another that if one be divisible the others must be correspondingly divisible, they maintained that space could not be continuous, but that it was composed of indivisible elements; and that time likewise was reducible to corresponding indivisible time-elements. Although the Kalam exercised a great influence on the earlier Jewish philosophy, Atomism found nothing but adversaries among the Jewish philosophers. Saadia rejects the theory of atoms on the ground that it is impossible to imagine that atoms, having nomagnitude, could become dimensional bodies ("Al Imanâb weal-I'tikadat," ed. 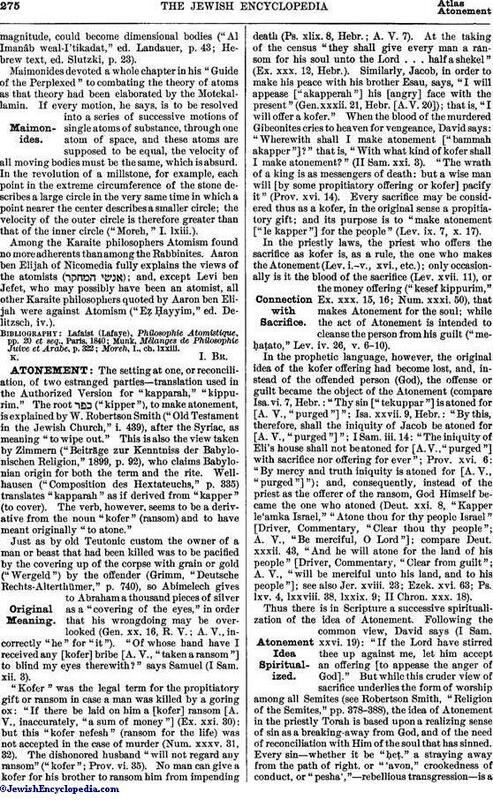 Landauer, p. 43; Hebrew text, ed. Slutzki, p. 23). Maimonides devoted a whole chapter in his "Guide of the Perplexed" to combating the theory of atoms as that theory had been elaborated by the Motekallamin. If every motion, he says, is to be resolved into a series of successive motions of single atoms of substance, through one atom of space, and these atoms are supposed to be equal, the velocity of all moving bodies must be the same, which is absurd. In the revolution of a millstone, for example, each point in the extreme circumference of the stone describes a large circle in the very same time in which a point nearer the center describes a smaller circle; the velocity of the outer circle is therefore greater than that of the inner circle ("Moreh," I. lxiii.). Among the Karaite philosophers Atomism found no more adherents than among the Rabbinites. 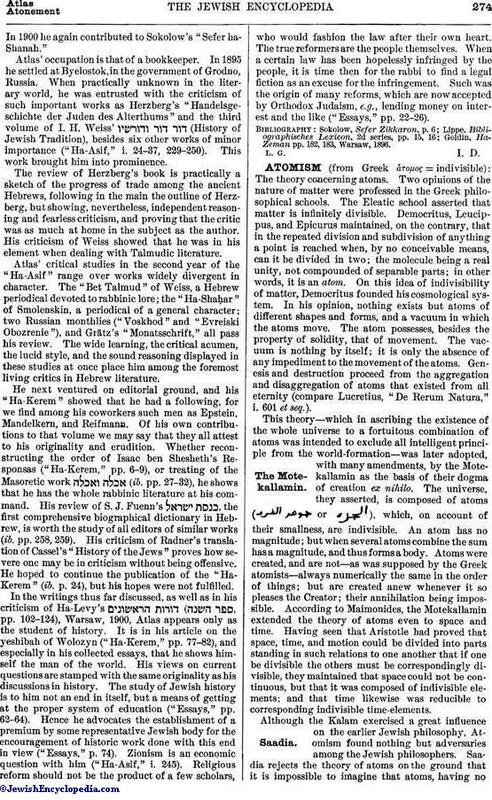 Aaron ben Elijah of Nicomedia fully explains the views of the atomists ( ); and, except Levi ben Jefet, who may possibly have been an atomist, all other Karaite philosophers quoted by Aaron ben Elijah were against Atomism ("Eẓ Ḥayyim," ed. Delitzsch, iv. ).